Well, winter has arrived. Ice and snow, below freezing temps. YUCK. This image is appropriate due to the name but the subject makes me long for warmer temperatures. 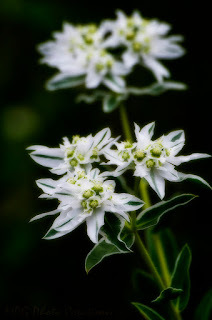 This is an image of a wildflower we have here in Kansas called Snow On the Mountain. It is in the Poinsettia family. Hope all of you out there doing Black Friday shopping are staying safe and that it's not too crazy.